Thousands of members of the anti-Catholic Orange Order are marching to celebrate the Battle of the Boyne, a 17th century battle victory by Protestant Dutch imperialist King William over the forces of the Catholic King James of Scotland. There are fears that loyalists and Orangemen could combine to create havoc in Belfast after one of their parades was refused permission to march through a staunchly republican area. In Ardoyne in north Belfast, where the parade this evening has been rerouted, the morning’s outward parade passed off without incident, although a far larger number of supporters than the 100 originally permitted to accompany the lodges and bands were allowed to march. Members of the nationalist Greater Ardoyne Residents’ Collective (GARC) protesting against the event were present both this morning and this afternoon, but there was no disorder. Nevertheless, there are concerns of potential trouble by loyalists this evening as marchers may attempt to make the return journey this evening along the same route. In a statement reminiscent of the infamous Drumcree standoffs, senior Orangeman Mervyn Gibson said yesterday that the return parade by three Ligonel lodges would “continue” until they were allowed to proceed along Crumlin Road. There are reports that thousands of loyalists are planning to converge on the Woodvale area of north Belfast to object to the rerouting of the evening parade. 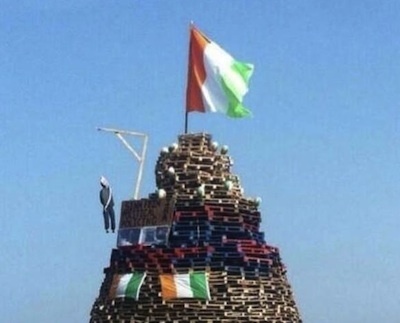 And amid angry warnings from the Orange Order, it was reported that the Combined Loyalist Military Command, which represents the UDA, UVF and Red Hand Commando, is to meet and issue a statement over the weekend. Their response could see days of potential violence and disruption. Senior UVF paramilitaries were reported to have taken part in a meeting at a Shankill Road bar yesterday to make plans to join Orangemen in a mass confrontation in north Belfast. Members of the group were ordered not to consume alcohol and to be prepared to join in a ‘protest’. The UDA-linked Ulster Political Research Group has also said it will support loyalists across the north over the weekend. In Carrick Hill, another contentious areas for Orange marches in Belfast, a number of loyalist bands pointedly stopped outside a Catholic church and played inflammatory, sectarian tunes this morning. The Parades Commission had previously said that only hymns should be played outside St Patrick’s Church in the Carrick Hill/Donegall Street area, and that there should be no stopping. The body’s determinations are supposed to have the force of law, but are generally ignored in the course of a loyalist march. There was also no attempt by the PSNI to stop loyalist supporters gathering along a section of the parade route from which they had been banned, although the area was sealed off from late last night. A small permitted protest by Carrick Hill parishioners was again ‘kettled’ inside an area some distance away from their own church -- just as transpired during a smaller parade last Sunday, when a spokesperson for nationalist residents, Frank Dempsey, was told he faced prosecuted for protesting illegally after he stood facing St Patrick’s. Frustration has continued to increase among nationalists in Carrick Hill in recent years as loyalists have been permitted to engage in increasingly insulting and provocative behaviour during parades outside the Catholic church. British Direct Ruler Theresa Villiers appealed for marchers and supporters across the North to “respect the rule of law”. Sinn Fein’s Gerry Kelly urged the Orange Order to rethink its position on the Ardoyne parade and “show leadership and pull back from increasing tensions in Belfast”. “While I respect everyone’s right to protest, I would urge the leadership of the Orange Order to carefully reflect upon the decisions they make in the coming hours and days.